TH E M R EP O RT | 37 E-LENDING GUIDE Special Advertising Section KEY PERSONNEL Dominic Iannitti CEO Tim Anderson Director of eServices Susan Iannitti Director of Advertising Michael Morford Director of Product Development Steve Ribultan Director of Business Development STAFFING More than 79 employees CONTACT INFORMATION 1800 W. 213 St. Torrance, CA 90501 Phone: 800.649.1362 Web: DocMagic.com DocMagic CORPORATE PROFILE DocMagic is the leading provider of fully compliant loan document preparation, compliance, and eDelivery solutions for the mortgage industry. COMPANY HISTORY Founded in 1988 by current CEO Dominic Iannitti, DocMagic, Inc., is the largest loan document production company in the U. S. Since its introduction DocMagic's flagship product DocMagic, has revolutionized the mortgage document industry. Through the years, this company has consistently developed award-winning solutions and technology to make clients more productive, promote operational efficiency and mitigate compliance risk. In the last two years DocMagic has introduced SmartClose and Total eClose ™ , bringing together all of the components necessary to facilitate a completely paperless digital closing. BUSINESS LINES, SERVICES AND PRODUCTS DocMagic has been a leader in the management and delivery of compliant document packages for lenders for more than 25 years. The company has expanded its offerings over the years to provide a full range of compliance and eMortgage services. Today, the company offers document management, compliance, eSign, and other eMortgage services, including SmartCLOSE ™ , a collaborative closing portal for TRID compliance. In addition, the company has a complete investor delivery service. PRODUCT SOLUTIONS The company's flagship product is DocMagic, an offering that consists of the people, the systems, and the technology to answer all the lender's mortgage document needs. It offers: • Seamless integration with leading LOSs • Free predatory lending and compliance auditing • In-house legal and compliance experts • Fully compliant eDisclosure delivery • Free setup and integration services • Integrated flood zone determinations • DocMagic's revolutionary eSign technology • Comprehensive Compliance Guarantee DELIVERY PLATFORM DocMagic can deliver its service in any way the lender requires, though most users use either DocMagic Online or DocMagic Direct through their loan origination system of choice. KEY FEATURES/BENEFITS DocMagic is specifically designed to keep lenders in full compliance with all state and federal regulations. Along with access to in-house legal and compliance specialists, lenders have access to DocMagic's compliance website, Compliance-Edge, which contains a wealth of information from legal analysis to news and resources. 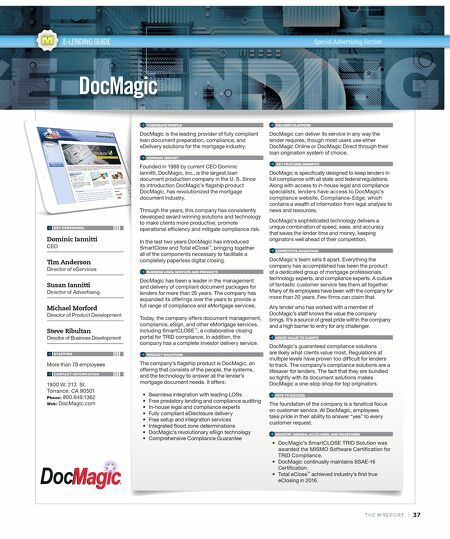 DocMagic's sophisticated technology delivers a unique combination of speed, ease, and accuracy that saves the lender time and money, keeping originators well ahead of their competition. COMPETITIVE ADVANTAGE DocMagic's team sets it apart. Everything the company has accomplished has been the product of a dedicated group of mortgage professionals, technology experts, and compliance experts. A culture of fantastic customer service ties them all together. Many of its employees have been with the company for more than 20 years. Few firms can claim that. Any lender who has worked with a member of DocMagic's staff knows the value the company brings. It's a source of great pride within the company and a high barrier to entry for any challenger. ADDED VALUE TO CLIENTS DocMagic's guaranteed compliance solutions are likely what clients value most. Regulations at multiple levels have proven too difficult for lenders to track. 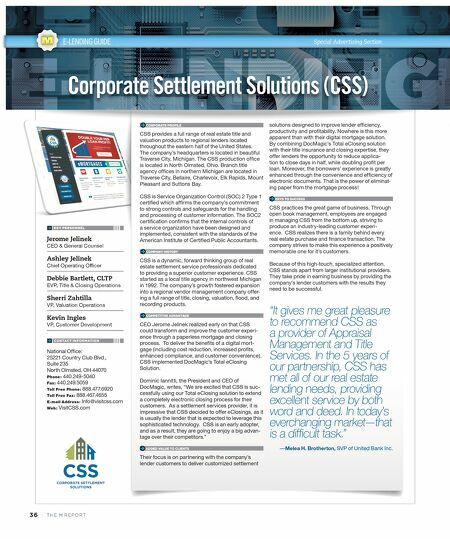 The company's compliance solutions are a lifesaver for lenders. The fact that they are bundled so tightly with its document solutions makes DocMagic a one-stop shop for top originators. KEYS TO SUCCESS The foundation of the company is a fanatical focus on customer service. At DocMagic, employees take pride in their ability to answer "yes" to every customer request. INDUSTRY AWARDS, ACCOLADES, AND MILESTONES • DocMagic's SmartCLOSE TRID Solution was awarded the MISMO Software Certification for TRID Compliance. • DocMagic continually maintains SSAE-16 Certification. • Total eClose ™ achieved industry's first true eClosing in 2016.